Sister Barbara Joan Zurine, S.S.N.D. 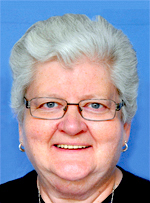 Sister Barbara Joan Zurine, a School Sister of Notre Dame, died Jan. 21 at Nazareth Hospital in from complications due to cancer. She was 65. After graduating from Riverside High School in Taylor, Pa., in 1967, worked at Mercy Hospital in Scranton, Pa., as a clerk and befriended several Sisters of Mercy at the hospital. She soon began to feel a call to religious life and decided to enter the Little Sisters of the Poor. She became a postulant at St. Martin’s Home for the Aged in Baltimore in 1972, professed her first vows in 1976 and final vows in LaTour, St. Joseph, France in 1981. As a Little Sister, she worked as a supervisor at homes for the aged in New York, New Jersey and Pennsylvania. While working at a home in Wilmington from 1995 through 2000 she befriended School Sisters of Notre Dame. In 1998 Sister Barbara professed final vows as a School Sister of Notre Dame. Among her ministries in the congregation in the Philadelphia Archdiocese were campus minister at St. Francis-St. Joseph Homes and St. Vincent’s Homes in Philadelphia from 2004 to 2014. “Her tireless work in accompanying the girls in times of crisis, teaching them self-value and Catholic identity work was remarkable,” said James Amato, deputy secretary for archdiocesan Catholic Social Services. The funeral Mass for Sister Barbara was celebrated Jan. 26 at St. Peter the Apostle Church in Philadelphia. The burial was Jan. 31 at Villa Maria Cemetery, Glen Arm, Md. She is survived by her niece, Jennifer Chuprun.